Etoile Slogan Jumper is rated 4.9 out of 5 by 7. 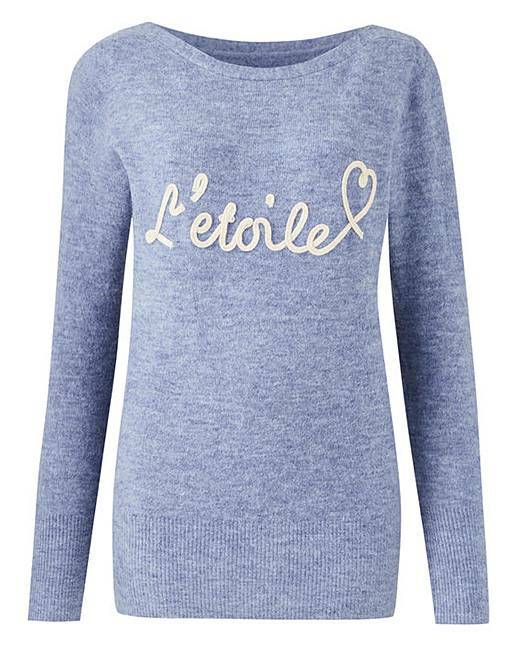 Look 'the star' of any room in this L'Etoile Slogan Jumper. Featuring a slash neck, supersoft knit and metallic slogan to the front. Simply pair with jeans and ankle boots for a gorgeous daytime look. Rated 5 out of 5 by Lisa Cooper from What a stunning jumper! This is the softest jumper I have ever had! I am afraid to wear it ha ha! I don't want to spoil it, will be wearing this to death next winter! What a beautiful jumper! Thanks! Rated 5 out of 5 by jbg29 from lovely style Lovely colour and style. Length great and doesn't stretch out of style. Very soft fabric to. Rated 5 out of 5 by Terry 16 from Exactly just right! Recently purchased this item and loved it as soon as I saw it.Attractiveband so comfortable to wear. Rated 5 out of 5 by BK 71 from casual jumper True to size. Ive worn it twice now. Its feel is soft against your skin. Nice shape to neckline. Yes would recommend, even though I thought it was a bit pricey. Rated 5 out of 5 by ExWRAF1 from Lovely jumper - but may bobble This jumper is a lovely colour and very soft. Only worn once so far, but I have a feeling that it may bobble. I hope not, because it feels so lovely to wear. Good sizing.